We were well impressed with Felix Baumgartner’s jump, where the Austrian hurled himself out of a space capsule a whopping 24 miles up in the air. Well, when we saw Fearless Felix, we thought we’d like to have a go at it, here’s our run down of some crazy adventure holidays… If that’s what you’re into! Enjoy! Wife Carrying this is not strictly for husbands and wives, but each male competitor must carry a female teammate across a special obstacle track as quickly as possible. There are various techniques including piggyback, fireman’s carry or our personal favourite, Estonian style, where the wife hangs upside down, holding onto her husband’s waist with her legs over his shoulders. It started in Finland but is growing in popularity in the USA. Zorbing Hop into an inflatable orb, (usually) made of plastic and you’ll be pushed down a nice gentle slope. Not really extreme, but included in this list for its level of unusualness. The first zorbing site was in New Zealand, but it’s spread globally (possible after its use in Gladiators!) and is a hit in Spain, Portugal, Czech Republic and Greece. Chess Boxing A kind of hybrid sport, chess boxing was invented by a Dutch artist this is one of the craziest ‘adventure holidays’ you could ask for. It’s made up of eleven rounds – six of chess, each lasting four minutes and five rounds of boxing, each three minutes long. Participants have to be as good at boxing as they are at chess. It’s very popular in Berlin and London and growing in places like Los Angeles and Tokyo. Cheese Rolling Take one massive wheel of cheese, throw it down Cooper’s Hill in the Cotswolds, and watch as competitors break arms, legs or teeth trying to catch it. As soon as the cheese is thrown a group of twenty or so participants leap down the steep hill and the first one to cross the finish line wins. The intensity of their injuries is a badge of honour in this case. Limbo Skating One for the flexible only, we’re told this is the latest rage in India, where riders wear rollerskates and stretch eye wateringly low to pass under cars. This requires some serious strength and balance. Volcano Surfing Yes, this is a thing. It is a fairly new sport having just been discovered/invented and sees surfers use a thin layer of plywood or a metal board to travel down a recently erupted volcano. Riders hike to the top and sit, slide or (attempt) to stand on the board all the way down. So far, we’ve only found evidence of this new sport in Nicaragua. Camel Wrestling If you’re on holidays in Bodrum in Turkey, you have to check this out. After a camel beauty pageant, entrants (the camels) are set on each other to fight it out over a female. It’s actually strictly controlled to protect the animals taking part. Bog Snorkelling Every year in Wales, crowds gather to watch competitions swim up a 133 metre stretch of bog water, filled with weeds and muck. ‘Nuff said. Crocodile Bungee Jumping If you’re a bit bored of regular old bungee jumping then this will spice things up a bit. Already a bit of a hit in Oz, croco-bungee sees jumpers hop into water which is home to the snappy animals. Cliff Diving Championed by Felix’s buddies at Red Bull, cliff diving is becoming more and more popular all around the world. Not for the faint hearted, this takes a lot of effort, training and dedication. Spectacular to watch, it’s one of our favourites. In the past few years alone there have been huge competitions in places like the Azores, Yucatan Mexico, the Aran Islands off Ireland, Athens, Greece and plenty more beyond. The whopping Victoria Falls and its surrounding area is a once-in-a-lifetime place to visit. Also known as the Devil’s Pool, September to December provides the ultimate in swimming at the edge of the world. The current at Victoria Falls between Zambia and Zimbabwe forms a small pool, where visitors can watch over the 355 foot waterfall. But, would you be brave enough? Pilots had to keep their eyes wide open flying into Hong Kong’s Kai Tak Airport, a sharp and difficult right turn made it especially hard and gave no chance for error. The airport was closed in 1998. Pilots and passengers may need to cross their fingers flying out of Matekane, Lesotho, as a 2,000 foot drop appears fast at the end of the short runway. A plane spotter’s delight to see a landing at Princess Juliana International Airport, St Maarten, Caribbean. You only get once chance at Tenzing-Hillary Airport, Lukla, Nepal. Beautiful for passengers, but pilots have to fight wind shear and sever turblence to land at Narsarsuaq Airport in Greenland. Cross winds are the biggest problem at Funchal Airport in Madeira. Barra Airport in Skye is actually just part of the beach and it’s take offs and landings are ruled by the tide. Number 8 Spending Christmas in Greenland? None of that brussel sprout stuff for you, locals feast on a fine delicacy called Mattak otherwise known as raw whale skin. Number 7 Use your boot to get a man. Single women in the Czech Republic throw a shoe over their shoulder while standing with their back to the front door. Not to knock someone out and nurse them back to help (haven’t we all thought of that?) but if the shoe lands pointing to the door, it is said the lucky lady will be married within a year. Number 6 Add a spider to your tree. In the Ukraine it’s tradition to hide a spider and its web somewhere in amongst the decorations on the tree. Whoever finds it is said to be blessed with good luck for the year to come. Number 5 Hide your broom. In Norway it’s thought the barrier between evil spirits and ghosts is at its thinnest on Christmas Eve, so naturally enough the ladies of the house go mad hiding their brooms, while the husbands go out with their shotgun to try to warn off any overly-motivated spirits. Number 4 Christmas is for eating. That’s a given. We’re used to Turkey, stuffing and sprouts, but in Japan, KFC on Christmas Day is so popular it can be ordered up to two months in advance. Number 3 get your skates on in Caracas, you’ll need them. In Venezuela’s capital city it’s tradition to rollerskate your way to early morning church services. The streets are even blocked off to allow worshippers get to their destination safely. Number 2 Santa’s evil twin in Austria At Christmas all across Austria, where a demon creature comes to life to punish children. This guy is Santa’s bad half and we promise he’d scare anyone! The Krampus is let loose on the streets to frighten and beat children into better behaviour. The number 1 has to be Catalonia’s poo log. Caga Tio, the smiley Yule log is seen throughout the region – if you’re in Barcelona you can’t miss it. A hollow log is set by the fire from Dec 8th and fed every night and covered with a little blanket to keep him warm. On Christmas Eve the log is beaten with a stick and a cheerful song orders him to poop. This week, three Russians claimed to have spotted a group of yetis on the prowl in a remote region of Siberia. The two fishermen and one forestry worker assert to have seen the legendary creatures three times in recent weeks, once mistaking them for people, due to the way they walk on two feet. One Russian commented, “We shouted ‘do you need help?’ They rushed away, all in fur, on two legs”, while another added, “Our binoculars were broken and didn’t let us see them sharply. They walked like people.” They were spotted in the Kemerovo region, where yeti expert Igor Burtsev claims more than 30 live. He will travel there next month to investigate. Iceland’s answer to the Loch Ness Monster? 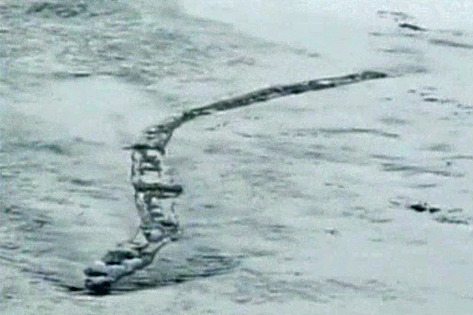 In February of this year, something akin to The Loch Ness Monster was spotted by a farmer in a lake in Iceland. Winding its way through the Jokulsa River in the Fljotsdal valley, the creature has been linked to a legend spanning seven centuries, that of the Lagarfljot river worm. Traced back through the country’s folklore to 1345, the legend goes that a small heather worm was put onto a golden ring so that the precious metal would grow and so in turn the ring. However, when the owner of the ring returned he found that the ring was no bigger, but that the worm had grown enormously. The owner threw the ring and worm into Lagarfljot River where the creature continued to grow and grow. Watch the YouTube video and let us know what you think. The famous Feejee mermaid, which was later proved to be a monkey’s torso grafted onto a salmon’s tail. Earlier this year, more than a dozen people have reported that they’ve seen a half fish, half woman creature in Israel. Shlomo Cohen, a former soldier, told Israel News that he and a friend “saw a woman lying on the sand in a weird way,” in Kiryat Yam, a city near Haifa. When they approached her, she suddenly jumped into the sea and disappeared. 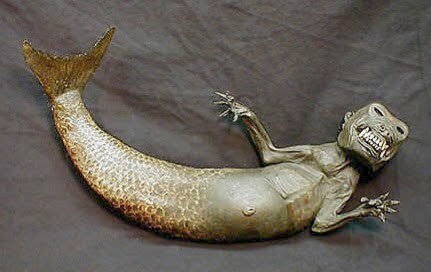 The small city even offer a prize of US$1 million for those who can prove the existence of the mermaid. “Many people are telling us they are sure they’ve seen a mermaid and they are all independent of each other,” Kirvat Yam town council spokesman Natti Zilberman told Sky News. Still from the Patterson film that dumbfounds scientist to this day. 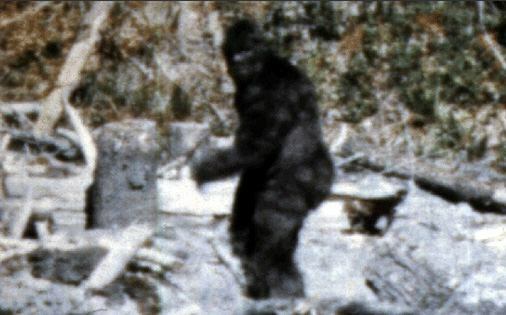 Sasquatch, or Bigfoot, as it they have come to be known as, have been spotted all over the US, however the greatest Bigfoot footage of all time is the Patterson-Gimlin film, shot in California. Roger Patterson and Robert Gimlin were researching Sasquatch reports near Bluff Creek on October 20, 1967,k when they came across an overturned tree. As the pair rounded the tree, they spotted a large figure beside the creek, which caused Patterson’s horse to rear. After untangling himself from the reins, Patterson spent about twenty seconds removing the camera from his saddlebag, meaning by the time he began to film the creature, Patterson was 37 m away. 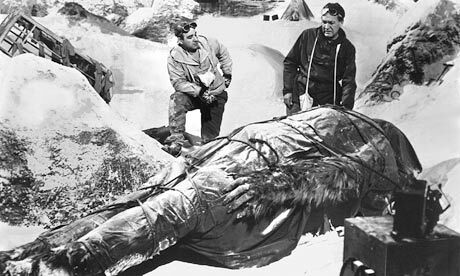 The most famous section of the film he then recorded shows the sasquatch look over its right shoulder at Roger, who then falls to his knees. The creature in the video matches the description offered by others who have witnessed a Bigfoot – most recent of which was by a student on a school trip in Idaho. Fancy something really different on a holiday? Head for the simply stunning Waterfall restaurant at the Villa Escudero in San Pablo City, Philippines. Lunch is served on bamboo tables, as the crystal clear water runs underfoot. After indulging in a delicious lunch of local favourites, you can work off the calories with a little bamboo rafting, hiking or dancing. For anyone who prefers a more sedate afternoon activity, the bird watching is second to none. Book a cheap holiday with PurpleTravel.co.uk today. Long stretches of white, sandy beach not quite your thing? Then how about visiting a green beach, or one made of glass? Here’s our rundown of the world’s weirdest beaches. This Fort Bragg beach is famous after Mother Nature reclaimed it from dumping that happened until the 1960s. Decades of waves on the beach have worn down the glass that was left there, leaving a sparkling, multi-coloured beach that is a joy to look at. You have to *really* want to get to Papakolea Beach in Hawaii. Visitors have to spend three hours in the baking heat, hiking along the cliff edge. But for most people it is well worth it, for the sand is a rich olive colour, giving you a truly unique experience. The black volcanic sandy beaches you find on Tenerife are a total eye opener. Kids and grown ups will get a real kick out of it. The dramatic colour dotted with parasols and surrounded by bars and restaurants is a real contrast. This long, sandy beach may look totally normal, until you realise it’s filled with penguins. Over 3,000 of the flightless birds call this beach home and it’s quite the novelty to hang out with them for the day. Just don’t get too close, they’re not afraid to use those beaks! Speaking of animals, a trip to Cow Beach is perfect if you want to get up, close and personal with some bovines. Heifers and bulls mingle happily with bikini clad tourists, and despite the issues you would think would pop up, it’s a hugely popular choice with travellers. Imagine building your own hot tub on the beach? Well it turns out in New Zealand you can. Thanks to mineral water that flows beneath the sand up to 150 degrees, visitors can simply dig themselves a hole and settle in to their own personal hot tub. Croatia’s ‘golden horn’, this gorgeous beach is just a narrow spit of sand that extends about quarter of a mile from the shore. It completely changes shape depending on the current or the winds and makes the list for being simply gorgeous. Don’t forget you can book your holiday to any kind of beach you want with Purple Travel. With plans for the Discus Hotel in Dubai well under way, we felt it appropriate to give a little nod to the latest craze in hospitality. We’ve christened it, marine tourism. Sure, space tourism will be on the horizon soon enough, but until that day, the more audacious of tourists are checking themselves in to that great other beyond – the deep blue sea. Here ‘ocean view’ and ‘on the beach’ should be taken in their most literal sense; enter the new division of incredible underwater hotels. Named after the author of 20, 000 Leagues under the Sea, Jules Undersea Lodge was the world’s first underwater hotel. Located in Key Largo, Florida, the Lodge began life as La Chalupa, a groundbreaking research facility, when it was originally built in the ‘70s. It was later transformed into a hotel in 1986, catering especially to lovers of the marine world. Set about 21 feet under water, the hotel can only be reached through diving. Visitors who are not certified divers must first complete Jules’ three hour crash course in scuba diving before they embark on their underwater adventure. Then, after diving down through the mangrove habitat of the Emerald Lagoon, guests resurface through a wet room entrance, and find themselves in a treasure trove of modern day life conveniences. Escapism is taken to extraordinary new heights (or should we say depths?) at this secret underwater clubhouse. When taking a break from marvelling at unobstructed views sea life in their natural settings through 42-inch windows, guests can enjoy all the creature comforts anyone could ask for. Expect to find air-conditioning, hot showers, a stereo, a DVD player and the world’s only underwater chef, who will serve breakfast at 8am every morning and dinner at 6pm, promptly. Jules really is the perfect balance of relaxation and adventure. On an average evening the hotel is shared by two different couples, but it can accommodate a group of six friends in the congenial living quarters, designed by the award-winning firm of Richard F. Geary Interior Designers. However, exclusive use of the hotel can also be arranged for couples and the Lodge is even available for underwater weddings. Not every undersea resort requires its guests to dive, or even to get wet. Poseidon Undersea Resort, located 40-feet below sea level in a 5,000 acre Fijian lagoon, can be reached by the convenience of an elevator. The $200 million Poseidon development, which includes seaside bungalows above the waterline, begins on a mile-long, palm-shrouded crescent of Fijian island. The elevator takes you down to the two dozen luxury suites, and also the restaurant, library, conference room and a convertible wedding chapel. Poseidon undersea is the first ever 5-star luxury underwater resort, and the brainchild of is L. Bruce Jones and his company, U.S. Submarines, renowned builders of deep-diving mini-subs and submersibles. Each of Poseidon’s suites is encased in a clear acrylic shell, four inches thick and a simple press of a button on your control console will feed the outside fish. Pretty impressive, right? However, guests looking to get in on this James Bond-style adventure will have to cough up a whopping $15,000 per person for seven days and six nights. Utter Inn is styled like a retro Swedish house, all painted brick red, with white trimmed windows. Primarily an art project by Mikael Genberg, Utter Inn offers underwater accommodation to the public (and by that we mean at affordable prices). After pulling up to the Inn by an inflatable boat that picks you up from the port of Vasteras, guests can step down into their room, which is three metres below water level in Lake Malarenl, Sweden. Then, after receiving all the instructions guests need, they are then left completely alone to enjoy their unique experience. Although alone, guests are also welcomed to use their inflatable canoe to visit the closest uninhabited island. Or if they prefer the ‘deluxe’ package, someone can deliver dinner by boat in the evening – hey, we’re talking about what an artist considers deluxe here, not a billionaire submarine company owner. Ok so you won’t be able to spend the entire night underwater here, but at the Ithaa Undersea Restaurant at Conrad Maldives Rangali Island, you’ll get a taste of the general idea. The restaurant serves up Maldivian-Western fusion cuisine, in the world’s first all-glass underwater restaurant. Offering unobstructed 180-degree views of the surrounding reef, Ithaa Undersea Restaurant offers diners the chance to marvel at 180° views of reef and marine life, whilst sipping on champagne cocktails. And located around 16 feet below sea level in the Indian Ocean, there are some truly spectacular sights to behold. You should read : A hotel in a sewer?! If you want to stock up on cool points then of course a convertible or helicopter would be a top choice for travelling, but if you want real fun, then we think ‘the weirder the better.’ So, we’ve put together a little list of some of the more unusual choices of holiday transport. Stranger than a camel, faster than your two legs, here are our top 5 weird ways to see your destination. Ok, so no one is ever going to look super cool on a segway, but don’t let that put you off. No, really, don’t!! These electric powered bike/unicycle hybrids have been bringing the energy deficient around since launching a couple of years ago. You’ll find them in lots of sun destinations and are really popular with kids who love whizzing around in circles. Plus they’re really simple to use, so you can breathe a sigh of relief that they want a go. However, we’ve got a warning for you… if Justin Timberlake can’t even make it look good, you might just have to accept you won’t win any cool awards! When in Rome… or in this case Venice, a gondola trip might seem pricey or touristy but it’s well worth it. The good news is gondola fares are set by local officials, which means you can usually find a better price if there are a couple of you together. But, in our opinion, a trip with just you, your other half and your driver around the canals under the moonlight is a truly magical experience. Ps. Singing is not obligatory for gondoliers, but you might just get lucky! It might not strictly fall under the category of travel, but zorbing is about as much fun as you can have in an enclosed plastic sphere. It’s sort of built like a bubble of plastic inside another, you get strapped in and hold on for dear life. So, hop in and you’ll be rolled down hill for a seriously adventurous and sometimes a bit of a bumpy ride. A quick warning, zorbing is not really for the faint-hearted, so remember this before you commit to it. Yes, you did read that right. The beer bike is basically a little caravan with seats that carries 30 litres of beer and up to 18 people. You’ll find it in Amsterdam and better get ready to put your pedal power to action, as you help driver Bob to cycle it around the city. Did you know New York City offers kayak tours? No, us either, but now that we’ve thought about it, we’re dying to go. Head down to Pier 40 on Houston Street and you’ll get hooked up with your very own kayak to take down the Hudson. Take in the sights like the Lady Liberty, and views of the Manhattan skyline as far as the Brooklyn Bridge.